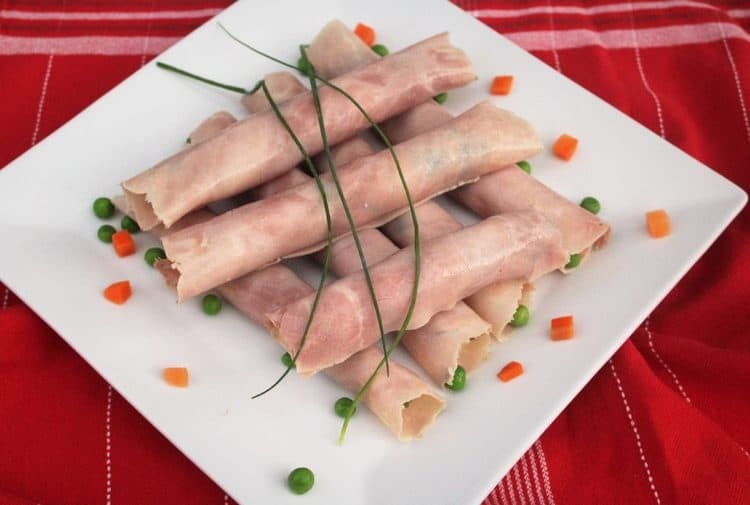 I first sampled these Russian Salad filled Prosciutto Cotto Rolls during a recent trip to Sicily. 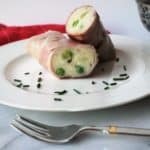 I was hooked at the first bite of these creamy potato salad filled bundles served as an antipasto! You may have noticed a pattern in my latest posts. One by one I’m recreating my favorite dishes that I ate in Italy this summer. And there are oh so many of them so bear with me! I’m quite sure that my family is enjoying the process of my testing all these wonderful new recipes. If all goes well I should be posting my absolute favorite of them all very soon so stay tuned! 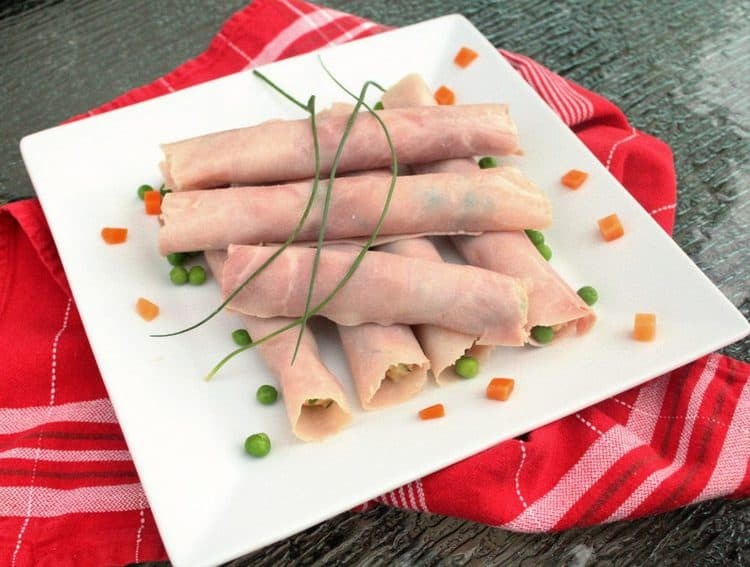 Today’s recipe is probably the easiest to make of all of them, a simple antipasto of Russian Salad filled Prosciutto Cotto Rolls. 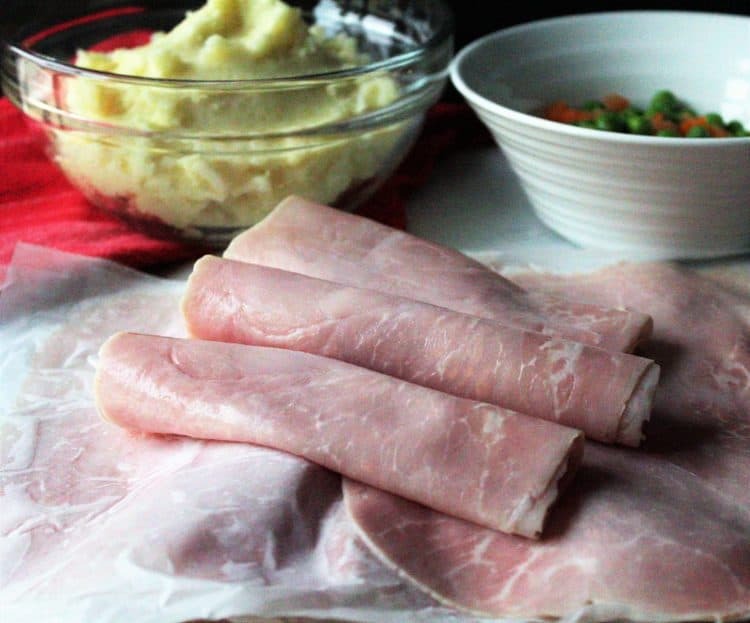 Prosciutto cotto is basically cooked ham in Italian. I love antipasto! Antipasto, appetizers, tapas, whatever you want to call them. I just love to nibble on lots of little dishes rather than one main course. This way I get to taste more food! Makes sense, right? Whenever I eat antipasto I’m too full to eat the main dish anyhow. grilled, rolled and stuffed zucchini and eggplants. Each dish delicious, one better than the last. 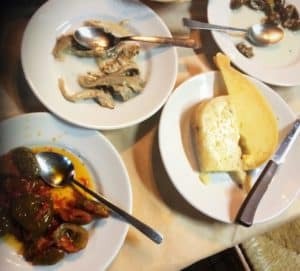 To the right is a tiny sampling of the many antipasto plates I stuffed myself with in Sicily! But the most interesting of all these antipasto were these Russian Salad filled Prosciutto Cotto Rolls. This is something I had never seen nor tasted before but were a delicious surprise. In fact, I wasn’t quite sure what I was eating and had to ask my host what was inside. 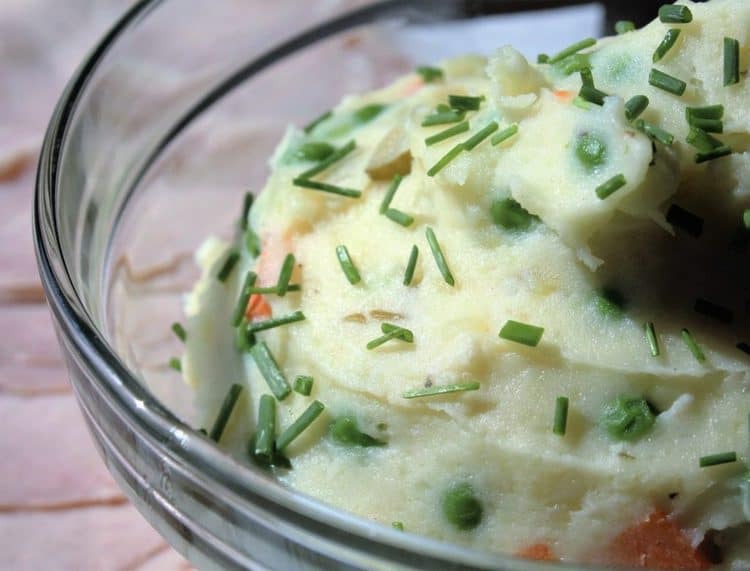 Creamy mashed potatoes with mayonnaise, peas, carrots and small chunks of giardiniera. Yes please! Here’s another dish I can easily fill up on and no bread needed here! In case you’re wondering why the name Russian salad, well I did a bit of research and it seems that potato salad with mayonnaise and carrots and peas is referred to as Russian salad. I learn something new every day! As I did not ask my relative who made them what they’re called, this is the recipe title that I chose. I totally recommend them next time you put together a buffet of antipasto. A great idea would be to cut them in half or even in thirds depending on the size of your prosciutto cotto slices in order to serve as bite size pieces. Buon appetito! This irresistible antipasto dish consists of a slice of prosciutto cotto filled with a cream russian style potato salad. Boil the potatoes until tender. Place in a medium sized boil and mash the potatoes, add the mayonnaise and salt and pepper. Place a slice of prosciutto cotto on your work surface in a horizontal position. 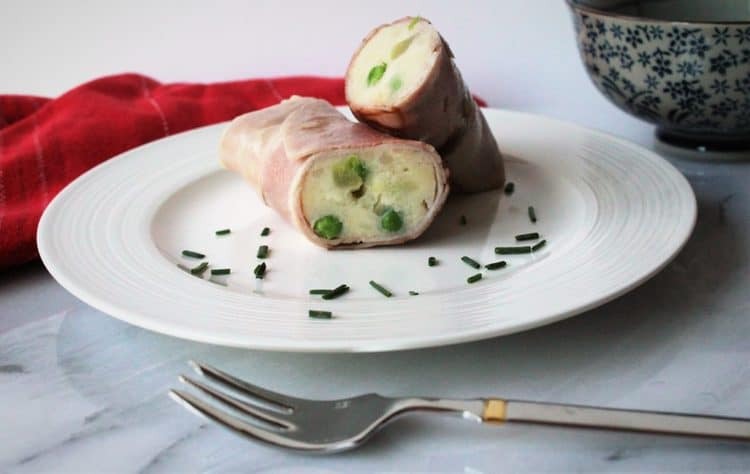 Place approximately 1/4 cup of the potato mixture on the lower end of the prosciutto cotto and roll tightly around the filling. Continue with the remaining prosciutto cotto. Nadia, these appetizers look delicious! I ate Russian salad in Spain for the first time and loved it. Will you be adding these to your catering menu? Thanks Liliana! I think I will include them.